In the Beginning Was Information is a fascinating book comparing the laws of nature with the laws of information which the author developed. 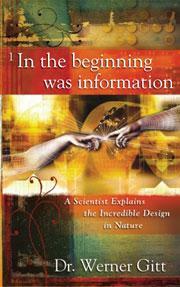 The book encompasses the logical development of what we take for granted, which is information. From the laws of information, the author deduces that the Creator must be the source of information, and all materialistic evolution models must be rejected as useless. He applies information to the Bible, showing how reasonable are the veracity of the Bible and the existence of a Creator. Information - it’s one of the most fundamental parts of our world, yet we don’t often think about it. This classic book, demonstrates the importance of information to life of any kind. More to the point, it demonstrates the necessity of an Organizer and Originator of the information necessary for life. Dr. Gitt argues that God is not bound by the laws of nature, but instead uses them for His own purposes. He also shows that the highly complex information present in DNA mitigates a non-intelligent beginning for life. He advocates for assurance when dealing with the Bible’s information, that this collection of books is not only free of error, but that no useless information is present, as well. This page was last modified on 6 August 2014, at 21:53.